Although it was falling apart it was actually well made and stable. It was missing two side sticks but I knew what to do with that problem right away. First I dismantled it completely, it had good long screws that I threw in the tumbler for them to clean up. The parts of the top and those used to kind of repair it in the past I got rid of. I then used one of the long sticks to replace the missing short one and all the long sticks I replaced with pretty sticks that we bought in a thriftshop back in 2017 during our trip to California. I filled up the screws and holes and already it looked much better! I brushed the wood clean but did not sand it smooth as I wanted to keep its texture. I choose 5 colors of paint to match what I wanted to use on the top. I painted the wood with a rough dry brush without trying to cover the entire wood (except for the first layer of dark brown) and then sometimes used a metal brush to rub it off for an aged look. The paintwork gets varnished as I use water-based paint. 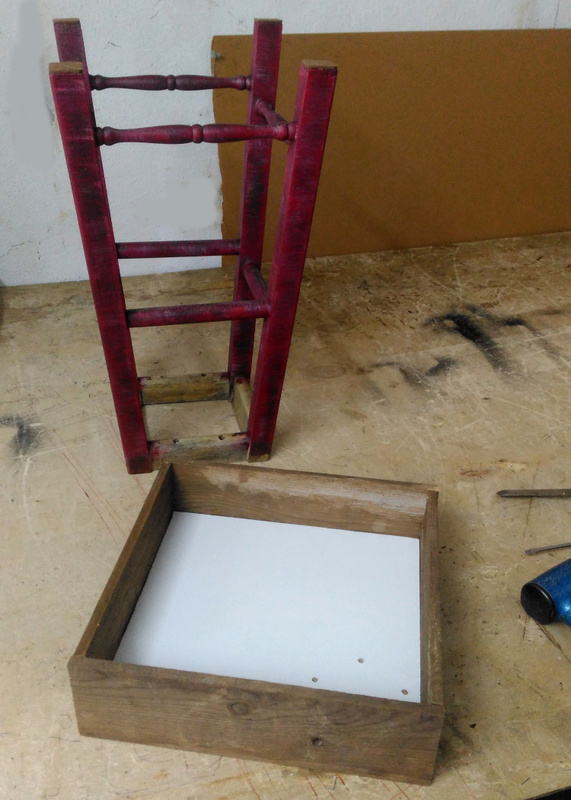 The feet got felt to protect both the paintwork and the floor it will live on :) I built the top of salvaged wood. 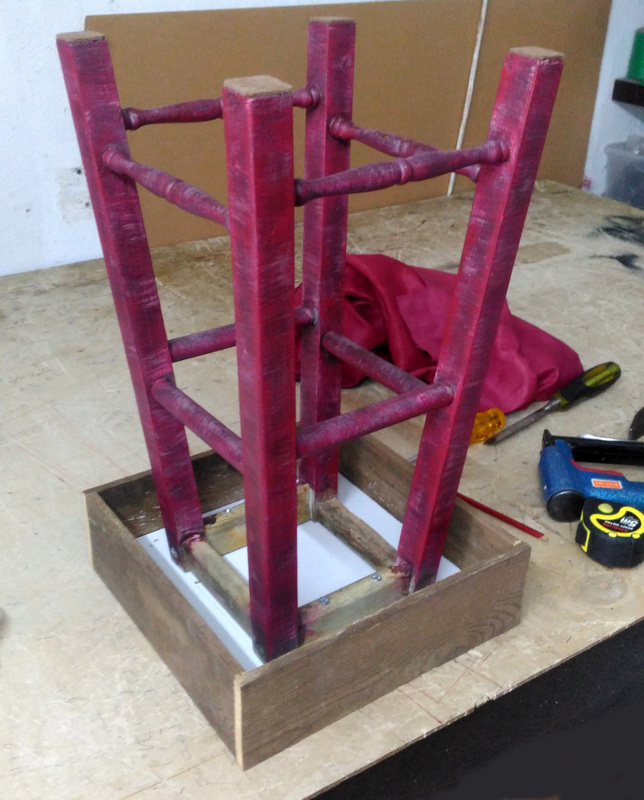 As this stool already was pretty high I needed to have a frame going down. The ugly bottom got covered with fabric. The top got a 5 cm foam and got covered again with the red lining fabric. And the top I covered with vintage kilim. 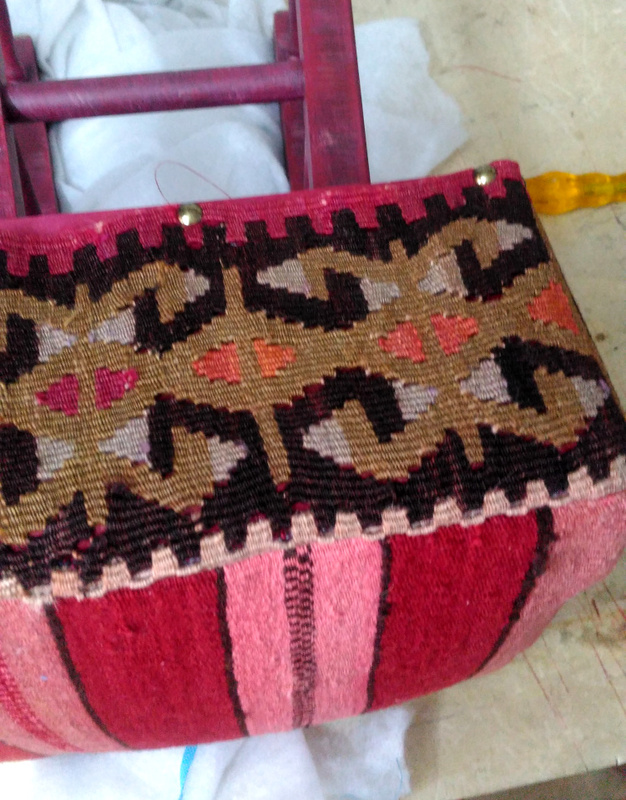 The side kilim has holes due to the way it is woven, hence why the foam needed to be covered with fabric first. This one might have the most extreme makeover yet till date, I'm so happy that it turned in to something pretty instead of ending up in a landfill. It is super strong and stable, and absolutely gorgeous to look at. Available at StarHomeStudio among many other one-of-a-kind furniture pieces and home decor. You made it absolutuely beautiful!